As I noted here last week, my most recent Verdict column discusses Cressman v. Thompson, in which the 10th Circuit rejected a compelled-speech objection to the display of what the plaintiff regards as a pantheistic image. I argue in the column that the 10th Circuit erred and I urge the SCOTUS to grant cert and reverse, even as I worry that a too-broad compelled-speech opinion could endanger anti-discrimination law. Here I want to follow up by considering a question about how the state might respond in future cases if Mr. Cressman ultimately wins. 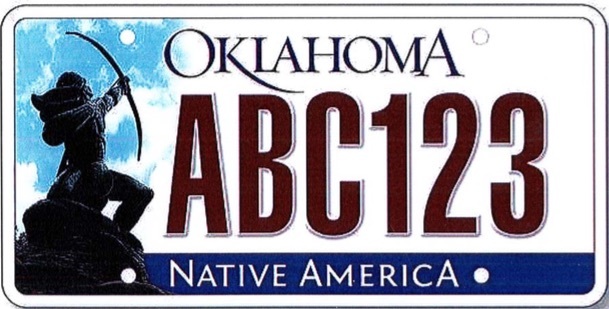 Below is the standard-issue Oklahoma license plate. When Cressman first approached the state authorities, he sought permission either to cover over the Sacred Rain Arrow image in roughly the left fifth of the plate or to receive a no-added-cost "vanity" plate--by which he actually meant a "special" plate--that would not bear the Rain Arrow image. Accordingly, if Cressman wins at the Supreme Court, it can be argued that what he will win, in addition to any damages and costs, will be the right to have either a free state-issued plate without the Rain Arrow image (like many of the special plates listed here) or an injunction against Oklahoma's enforcement of its law forbidding his obscuring the portion of the standard-issue plate that contains the Rain Arrow image. Under ordinary principles of remedies, the state would have discretion whether to comply with a ruling in favor of Cressman either by giving him a free state-issued plate without the Rain Arrow image or by granting him the legal right to cover over the Rain Arrow image on the plate. Given the procedural history of the case, it could also be said that Cressman waived the right to insist on one or the other remedy--although the complaint he filed in the District Court included the usual catch-all language that could be construed to include a request for a particular remedy. In any event, I'm going to assume the issue remains live, so that I can explore a question that usually goes unaddressed in cases involving compelled speech. 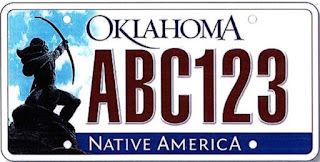 Suppose Oklahoma decides that it does not want to give Cressman a no-additional-fee special plate, perhaps because the state authorities worry that doing so would encourage other people to claim an objection to the Rain Arrow image as a means of getting a special plate without having to pay for it. Because a right against compelled-speech does not require an inquiry into sincerity of the sort required in cases seeking religious exceptions, this is a not-entirely-unrealistic fear. Cressman himself is apparently fine with taping over the Rain Arrow image, but we can imagine that other people might not be--and might complain that the state is still compelling speech: It requires Oklahomans to speak by either displaying the Rain Arrow image or engaging in the symbolic speech of taping over the Rain Arrow image. This argument is almost surely a loser as a matter of doctrine. After all, in Wooley v. Maynard, the successful plaintiffs won only a right to tape over "Live Free Or Die" on their plates: They were not entitled to state-issued license plates that didn't display that motto. To be sure, it appears that the Wooleys, like Cressman, didn't object to taping over the objectionable portion of the plate, and thus in a strict sense the issue hasn't been decided by the Supreme Court. But even so, it's hard to imagine the Court holding in favor of the claim imagined here. Why? Because the case law protects a right against compelled speech, not a right to silence. Consider West Virginia State Board of Educ. v. Barnette. There, the winning plaintiffs won the right not to participate in the Pledge of Allegiance, but exercising that right requires de facto symbolic speech that is at least as conspicuous as taping over Live Free Or Die or the Rain Arrow image. A schoolchild who wants to vindicate his or her Barnette right must either sit or stand silently while the rest of the class recites the Pledge. Silence--in the sense of not taking a position--is not an option. Note, by contrast, that in the school prayer cases brought under the Establishment Clause, the remedy is a prohibition on organized prayer--a true right to silence. That's what the plaintiff wanted with respect to the Pledge in Elk Grove v. Newdow: He argued that the inclusion of "under God" in the Pledge rendered it a prayer, and thus an improper collective exercise for anyone. His children were already entitled to opt out of the Pledge, per Barnette, but everyone understood that the Barnette right against compelled speech is not a true right to silence. To exercise it in a context in which a public school conducts the Pledge requires conspicuous disagreement. Does all of this make sense as a normative matter? Isn't there something valuable about a right to silence as such? It depends. I think that the compelled-speech license plate cases are right to allow the government to put individuals to the difficult choice of either going along and displaying a message with which they disagree (like Live Free Or Die or the potentially pantheistic Rain Arrow Image) or "outing themselves" as dissidents by visibly dissenting (by taping over the disagreeable portions of their plates). The reason is that the Supreme Court was not wrong in Walker v. Texas Division, Sons of Confederate Veterans to recognize that government-issued license plates have a strong government speech component. While I have my concerns with how far the majority in Walker went with that principle, the government element of the mixed government/private speech is considerably stronger in a case like Cressman's, which involves standard-issue plates rather than specialty plates. Protecting not only a right against compelled speech but also a putative right to silence by forbidding the government from putting its motto or logo on any plates strikes me as excessive. It's perhaps regrettable that to avoid compelled speech, people must sometimes dissent publicly, but at least for adults, the First Amendment sometimes demands a little courage. The argument for an actual right to silence is considerably stronger in a case like Barnette because the recitation of the Pledge cannot plausibly be described as government speech. So what justifies putting vulnerable schoolchildren to the difficult choice of either reciting an affirmation with which they (and/or their parents) disagree or risking the disapproving stares or worse that can come from visibly dissenting? In my view, nothing. The state has an interest in instilling patriotic values in the young, but if I were writing on a clean slate, I would hesitate to say that it may pursue that interest through indoctrination, even when children are formally given a choice whether to participate in the collective affirmation. I think there is a "right to silence" in various ways -- I don't have to say my positions on various things that I don't want to (if they extends to some right not to vote is an interesting question). The complication here is that government speech is involved. A state license plate, public schools, etc. There the obligation to cover over the symbol, make some effort to show you don't want to say the Pledge (or "under God") etc. makes more sense. The government has the power to speak too and cannot take into consideration everyone's beliefs there without some action on the part of some people. Still, seems useful as a matter of policy to provide the alternate license plate for free to those who have an ideological opposition to the other plate. Over the years I have suggested that neighboring NH provide a license plate message: "VOTE FIRST OR DIE!" Any thoughts on an intersection with Little Sisters of the Poor? The form the nuns are required to fill out (in order to preserve their free exercise of religion) can be viewed as a kind of compelled speech. The government and the nuns give a different meaning to that form (absolution in the government's view; complicity in the nuns'). We can also view the form as a remedy: whether it is merely the equivalent of black tape or something more onerous. I'm writing about the employee non-speech case for my Verdict column next week. I agree it's connected to the right to silence. Unlike most people I don't think that Heffernan is a 1A case. That's the way it has been framed in the courts but I think that in accepting that framing the courts below have done a grave disservice. In my view Heffernan is a basic "mistake of fact" case in the same way that Heien vs North Carolina was a "mistake of law" case. The fact that one is a criminal case and the other a civil case strikes me as not meaningful. If one accepts Heffernan as a traditional "mistake of fact" case then the normative question becomes whether a mistake can ever be a cause of official action. In my view a mistake, whether of law or fact, turns the decision maker's motive or interpretation into a nullity. I know that Heinen states differently but I thought that case was wrong decided and I think Heffernan shows even further how the courts "mistake" jurisprudence has lost its way.